By Robin Roberts (and Miles Better News Agency). TT-style or out-and-out performance through the wheels of the R8, but it’s also been piling up sales with estates. 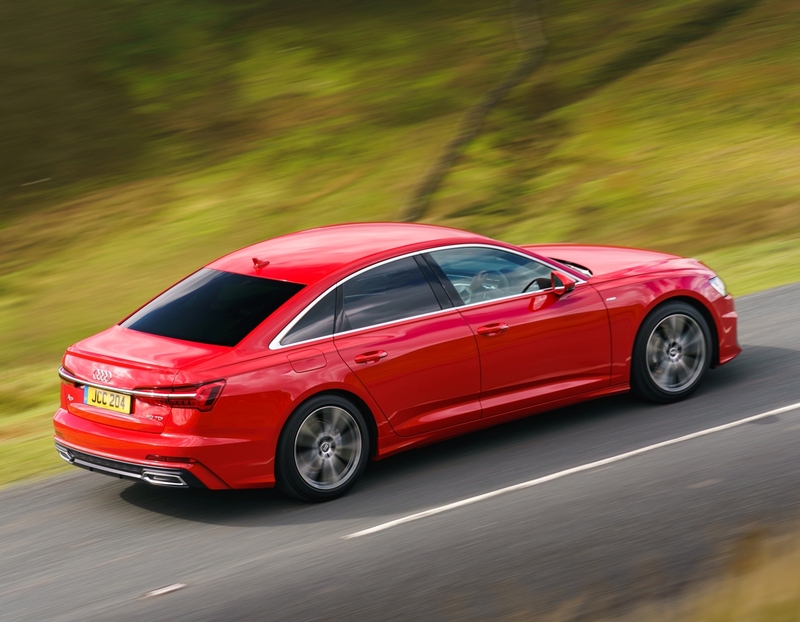 In the UK last year the A6 range saw an approximate 55/45 split between Saloon and Avant (Audi speak for ‘estate’) and totalled about 16,000 combined sales. That’s an impressive record when you also remember it has a multitude of modern SUVs in its showrooms. The first Audi 100 Avant appeared in 1977 so they have been onto a good thing for over 40 years. 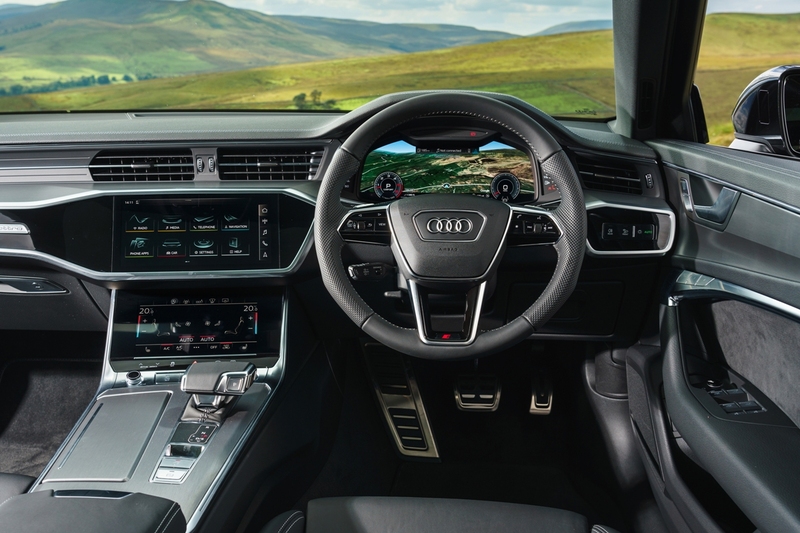 Audi A6 product manager Matt Rance offered an explanation at the launch of the 2019 A6 Saloon and Avant saying, “Our customers love estates and probably really use them as we intended and value them for their practicality and performance. “We have every confidence in these new models continuing where the old ones left off. In recent years we have also seen a slow but steady increase in sales of Avant models throughout our range as more are seen on the roads and buyers want to experience them. There is also the growing realisation that there are now so many SUVs in the market that their uniqueness and cache is diminished as they begin to look alike, and they represent a big investment with higher costs than a traditional hatchback, but what do you do if you need the SUV space? Enter the estate. Some canny manufacturers have seen this coming for a few years and have designed estate versions of each new hatchback while hedging their bets and budgets with an SUV from the same platform. You just cannot put all your eggs in one basket and produce an omelette when a customer wants something more substantial or different. 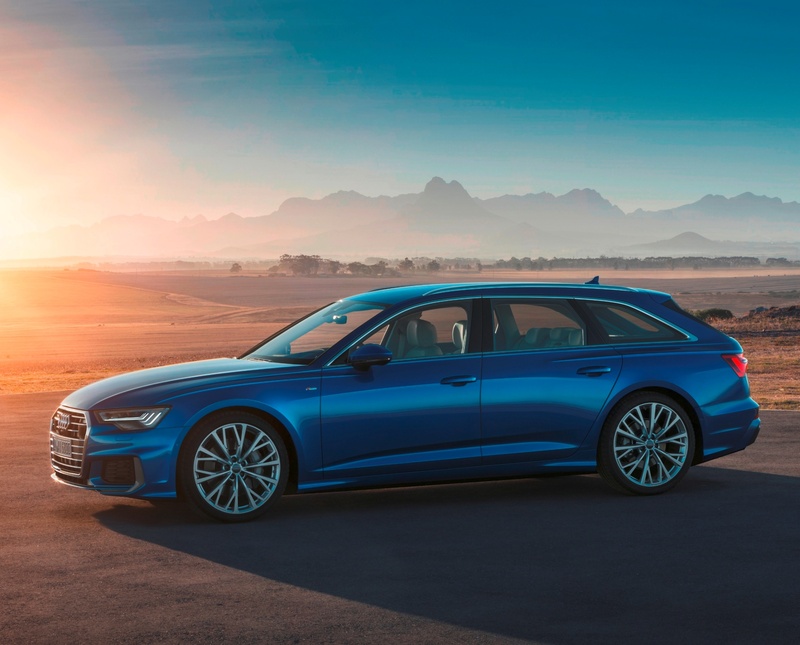 The new Audi A6 Saloon and Avant ranges are being launched with a choice of turbodiesel engines, the 204 hp 2.0 litre four-cylinder 12v mild hybrid seven speed automatic unit or the 286hp 3.0 litre V6 48v mild hybrid eight-speed automatic. Depending on trim and packs chosen you can select from four suspension systems. Petrol versions will follow as will intelligent on demand 4WD and permanent mechanical 4WD derivatives. There are Sport and S-Line trim levels but owners can choose from four packs of 39-features put together under the headings of comfort, technology, touring and assistance. They largely come from the bigger A8 which is the platform for the latest technology but now find their way into the A6 series. 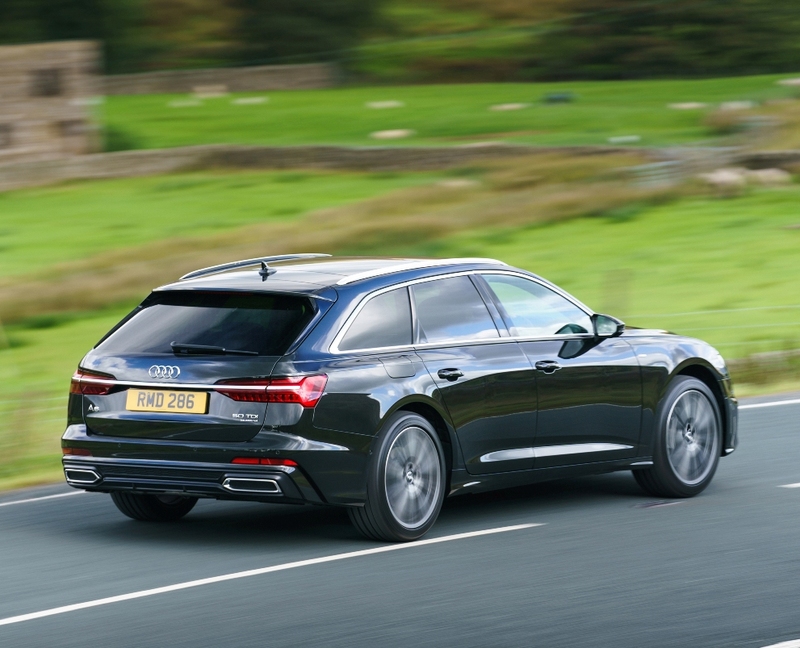 The newcomers are roughly the same overall size as the outgoing series except they have a longer wheelbase to improve passenger space and despite its sloping profile the A6 Avant packs in up to 1,680 litres (59.33 cu.ft) maximum, as much as the slightly boxier previous generation estate. Mr Rance said they will sell 60% with the 2.0 engine, designated 40 under the company’s numerical system, compared to 40% for the 3.0 so-called 50 models, and the majority will be the S-Line as the premium specification better holds onto value at resale and among the number-crunching leasing and business buyers which comprise most sales. The space inside the new A6 cars is really impressive, particularly for those in the back, and the Avant’s loadbed is easy to use and cavernous beneath a long cover. 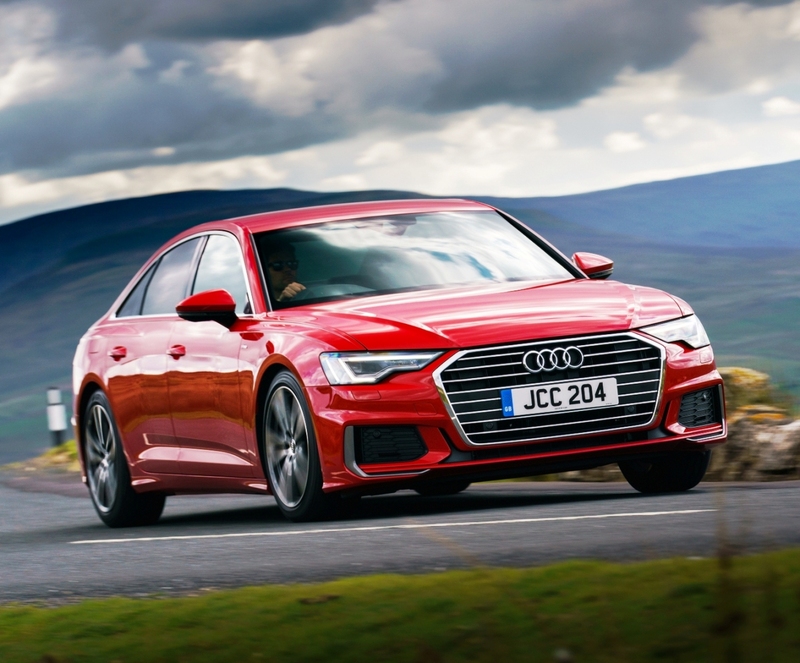 I first tested the A6 40-Saloon Sport and despite its steel sprung chassis it rode well, had a refreshing lightness to its handling and returned an indicated 44.2 mpg over a mixture of main and country roads. The 50-Avant S-Line came with self-adjusting suspension and rear wheel steering, which not only reduced the turning circle when going slowly but also enhanced high speed responses and made it feel more planted sweeping through rising and falling bends. That showed 32.5 mpg on the same route. The hybrid-assisted drive was seamless and provided useful extra urge for safe overtaking while noise levels were low from the powertrain but more noticeable from the road beneath. The automatic normal and sport mode transmissions were velvet smooth and instantaneous in action when you need to overtake. 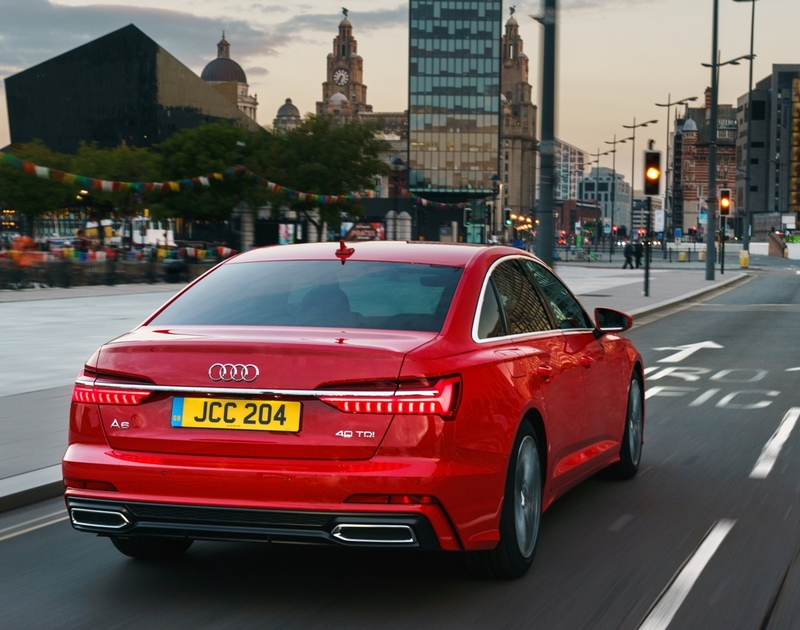 These new A6 models are all competitively priced against rivals and offer cutting edge technology on a scaleable basis within a very roomy cabin with the projection of good resale value. 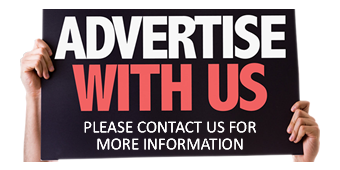 For: Very roomy with good boot, handles well and comfortable, quality feel and look to interior, excellent powertrain. Against: Road noise, cost to buy and BiK tax penalty with a diesel engine, average warranty. Audi A6 Saloon 40 Sport (anticipated best seller). Price: £41,110 (as tested with sports seats and tech pack £45,655). Engine/transmission: 204 hp, four cylinder, 2.0 litre turbodiesel with mild hybrid support, seven speed automatic, front wheel drive. 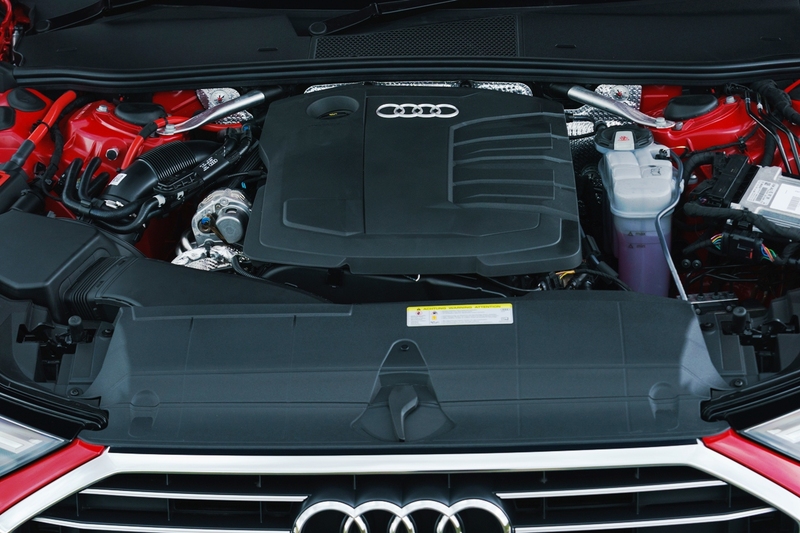 Performance: 155 mph, 0–62mph 8.1 seconds. Fuel consumption: Combined Cycle 62.8 mpg (44.2 mpg on test). 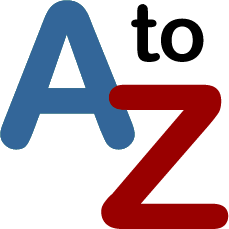 Emissions and taxation: CO2: 117 g/km, VED First Year diesel road tax rate £205 then Standard rate of £140 + £310 annual supplement for five years as it costs over £40K, BiK company car tax 28%. Dimensions/capacities: L 4.94 m (16.21 ft), W 2.11 m (6.92 ft), H 1.46 m (4.79 ft); Kerb 1,645 kg (3,627 lb); Boot space 530 to 1,680 litres (18.72 to 59.33 cu.ft).